Daytona Beach, FLA - It was a busy winter for the NASCAR Whelen Euro Series organization due to huge interest surrounding the official European NASCAR Series, one of the most thrilling, competitive and cost-effective in the Old Continent. Paired with the excitement for the new spectacular 2016 car, this makes the series one of the most attractive in Europe. 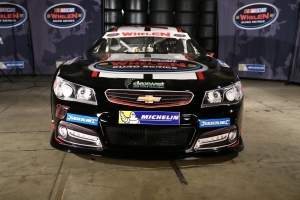 The NASCAR Whelen Euro Series, led by President / CEO Jerome Galpin, announced today that the 28 season entries available were all assigned for 2016. Some of the entries will be on a partial schedule and other teams will join on selected events, while there also are new teams finalizing their plans to enter late season events and gain the necessary experience to take on the full schedule in 2017. The preliminary season drivers entry list will be announced next week, as the teams complete their lineups for the third edition of the Valencia NASCAR Fest where the thrilling battle for titles and trophies will begin, a wave of bright talents will begin moving up the ranks and new young drivers will take their first turns in in their NASCAR careers.